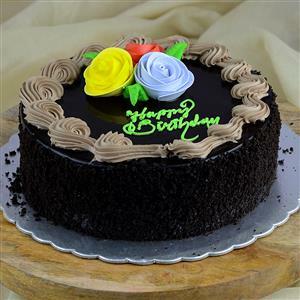 Send Birthday Chocolate Truffle Cake - 1kg to Chennai. Gifts to Chennai. Send Cakes to Chennai. Description : A delicious and yummy delicacy available in exotic choco taste to pamper the taste buds of your near and dear ones. Send this fresh and yummy 1 Kg Chocolate Truffle Cake with Happy Birthday Tag to your loved ones in Chennai through Gift2Chennai.com. You can also send other Gifts to Chennai. Please Note : Picture is indicative. Actual might vary.